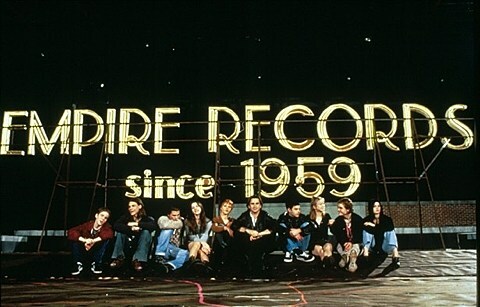 As mentioned, in celebration of Empire Records‘ 20th anniversary, Williamsburg venue Rough Trade NYC will be turning into the Empire Records store on April 8 for an immersive “Rex Manning Day” that includes a screening of the film, live music, a head shaving station, a chance to be part of a scene re-enactment and more. Since we last spoke, they added a second date: April 9 at the same venue. Tickets for both go on sale today (2/20) at noon. “Twenty years – to the day! – since the original Rex Manning Day, BBQ Films invites you to “Say No More, Mon Amour,” damn the man, and save The Empire. For one night only, Williamsburg’s Rough Trade is transformed into the legendary Empire Records, with all the staff and characters you’ve come to love (and hate). On April 8, [and 9] 2015, join Lucas and his couch cushion, boss Joe (but don’t touch his drums! ), Gina and her “Sugar High,” and, of course, Corey and her crush, Rex Manning… Immerse yourself in the world of Empire Records with a screening of the film, live music, a Rex Manning autograph, and, if you’re brave enough, a chance to shave your head for Debra’s funeral. Music-veto power available, pending Mark’s approval.